A 1 percent increase in local productivity leads to nearly twice as much purchasing power gain for local lower-skilled workers than it does for local high-skilled workers. When a city's manufacturing sector experiences a spurt in productivity, who wins? In Who Benefits from Productivity Growth? Direct and Indirect Effects of Local TFP Growth on Wages, Rents, and Inequality (NBER Working Paper No. 24661), Richard Hornbeck and Enrico Moretti find that national statistical averages mask wide disparities in workers' gains in purchasing power at local and regional levels. They conclude that the biggest winners are local low-skilled workers who own their homes. Higher-skilled workers and renters benefit more in other locations, indirectly through spillover effects. The study draws on plant-level manufacturing data and on information on local labor markets, housing markets, and demographic data for 193 metropolitan statistical areas from 1980 to 2000. Renters make up about a third of the workers in the sample. The researchers use total factor productivity (TFP) to measure productivity gains that result from innovation and increased efficiency both within the factory and without. These gains could arise from factors such as adoption of new technology by a plant, improved transportation networks, or changes in the regulatory environment. The change in purchasing power growth is calculated as the change in earnings minus the change in the local cost of living. The researchers find that a 1 percent increase in local productivity leads to a 1.12 percent medium-run increase in earnings for lower-skilled workers, nearly double the 0.6 percent gain for the more highly skilled. As a result, productivity growth reduces inequality at the local level. They attribute this effect to highly skilled, more highly paid workers tending to be more mobile geographically, and more likely to move to a booming area. Their swelling ranks reduce the premium they can command for their skills. Meanwhile, the pool of lower-skilled workers is less geographically mobile and so remains fairly constant in the face of productivity-induced increases in the demand for their services. The influx of workers drawn by a growth surge raises the cost of housing. 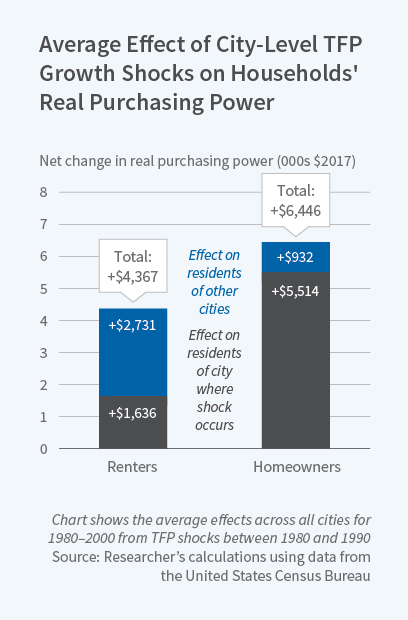 Existing homeowners benefit more than renters, who see two-thirds of their earnings absorbed by higher costs for housing and other goods and services. There are also spillover effects from one city's productivity gains to other cities. One city's economic boom draws workers away from other cities, and reduces demand in those areas for housing and other goods and services. Thus, renters in a non-booming city may gain at the expense of renters in a growing one. Likewise, skilled workers leaving a non-booming city strengthen the bargaining position of those they leave behind. The researchers point out that although the average U.S. worker saw purchasing power grow by 0.5 to 0.6 percent annually from 1980 to 2000, there are important differences across regions, cities within regions, and types of workers within cities. Disaggregation is therefore important for understanding who benefits from local productivity growth.